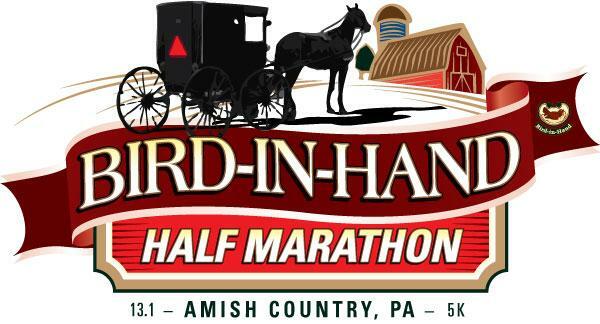 Join us for the 10th Annual Bird-In-Hand Half Marathon! Come run with us through Amish farmlands and the Valley of No Wires. You'll pass one-room school houses, gorgeous scenery, water stations staffed with Amish children, and run through an actual working Amish farm - not something most tourists get to do! The finisher's medal for the half marathon has been featured in Runner's World as one of the most desired. It's huge and heavy! Each one unique as they are real horseshoes from real horses working these farmlands. While this is certainly not the big city, the half marathon does have all the "usual" big city features - chip timing; tech shirts; awards handmade by local craftsman for overall, masters, and 3-deep in 5 year age groups; every turn and mile on the course marked; water stations every couple miles; fully supported race route; pace groups; EMS; photogrpahers; etc. PLUS a bunch of stuff that makes this event stand out, such as hot air balloons lifting off just before the race, horse-n-buggy leading the way, whoopie pies, and a post-race spread that can't be beat! Don't forget all the other activities that make this a jammed-packed weekend - expo, pasta dinner, kid's fun run, 5k, more hot air balloons, s'mores, and so much more. Go to www.bihhalf.com to see pictures, videos, and read runner feedback from past years. ***But don't wait too long - there is a hard cap! THIS RACE ALWAYS SELLS OUT!!!! Register TODAY!!! Kid's Fun Run - Friday, Sept 6 - 6:10* PM *NOTE new start time!!! Half Marathon - Saturday, Sept 7 - 7:30 AM Please note packet pick up for the half marathon is on Friday, Sept 6.